Hello, I'm new here. Looks like there is some great information on this website. I used to collect baseball cards back in my pre-teen years. 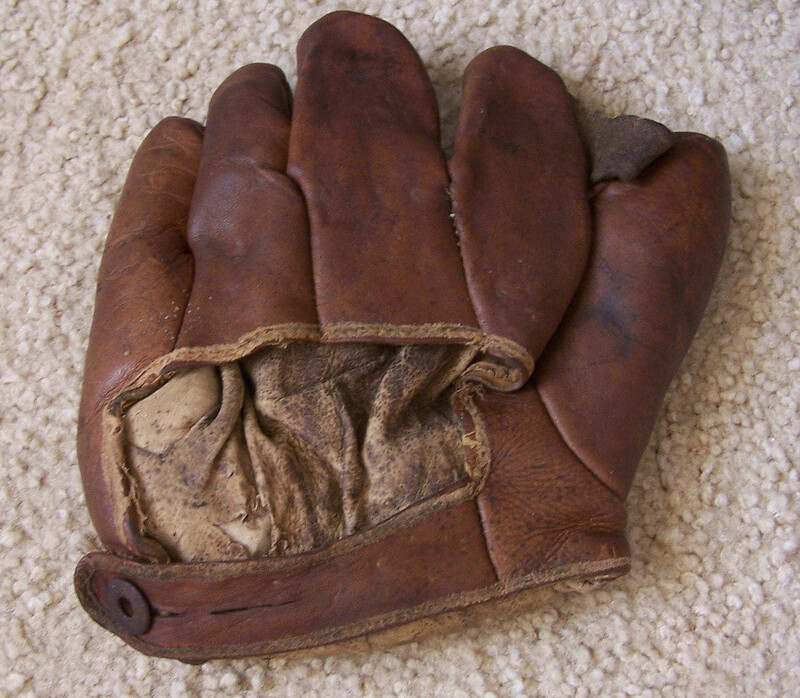 I was cleaning out some old boxes and came across this glove I had. 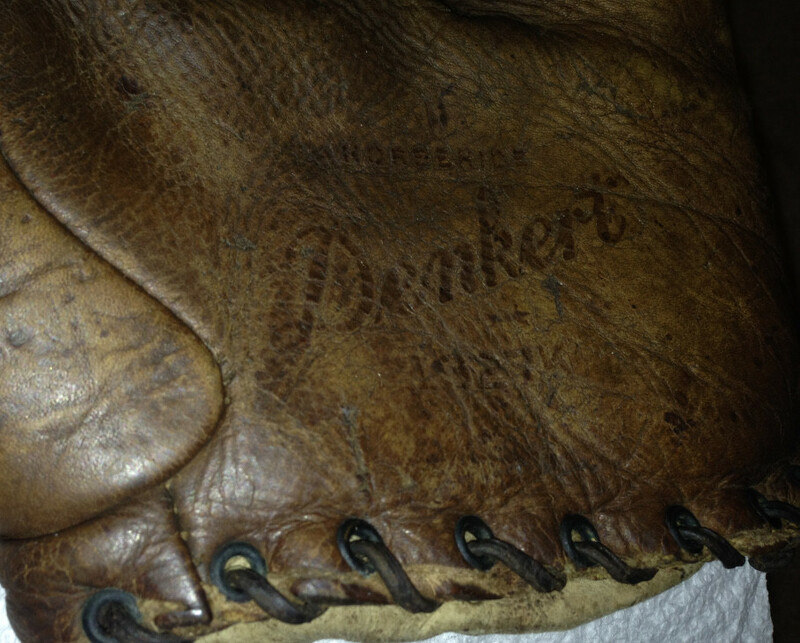 I actually remember using this glove to play catch with the neighborhood kids a couple of times. Anyway I was curious if it is possible to identify the date range or who the maker is? There are no marks on the button that I can see. Somewhere I have a similar right handed glove but the leather is a lighter tan color. Thanks & I'm looking forward to learning more from everyone here. Ok its a Denkert, I can see it now too. Thanks, mikesglove. Funny that I never noticed that stamp before. So how can you tell that its a youth model, because of the size? What do you guys recommend for cleaning these old gloves up. Saddlesoap or some kind of leather conditioner, I was going to display it on a shelf. The size is one aspect. Also notice no welting(leather strips) between the seams and the cloth piping. Saddle soap is an all purpose cleaner and conditioner. I have used it a lot. Your glove isn't too dirty so that should do the trick. It will also soften the leather. I have been using the GOJO waterless hand cleaner, both with and without the pumice. I really like it. Both the saddle soap and waterless hand cleaner leave a little lanolin in the leather. 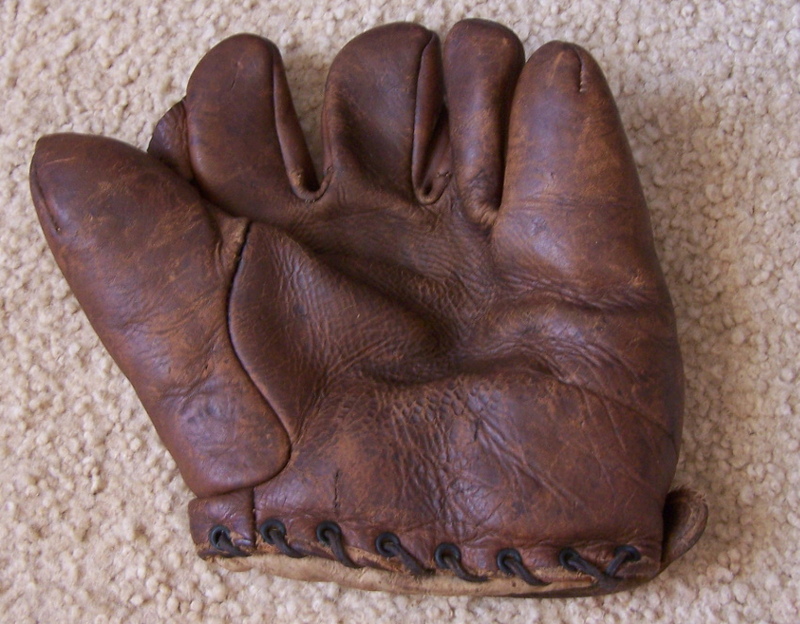 If your glove is extra dry, then a leather conditioner can soften it up and bring out the color of the leather. Dr. Jackson's Hide Rejuvenator and Lexol are good conditioners but can darken the leather. I would just try the saddle soap and a damp rag first but go easy on the soap as it can leave a chalky residue when dry. I cleaned it up some more & then I worked in some leather conditioner. The leather lighten somewhat but it still has some patina on it. I'm going to make a little stand then I think its ready to go on the shelf. For reference purposes here is a picture of how the stamps now.